So I’d been pretty out of it with the latest developments of Whitney Houston’s life. The little I heard about was bizarrely awful, and addiction problems always bother me in a very personal way. I felt like I was feeding the beast by even paying attention to it. But I just read a piece in Salon that tapped me into what it was like to be a girl in the 80s and dig Whitney’s ballads, and it gave me new respect for her talent for just nailing a song – I went back and listened to a few of them. The other thing it reminded me of was how ballads about star-crossed love really give me the creeps, and it’s not just because they leave me limp, although that doesn’t help. Maybe it kind of is because they leave me limp. There’s a weird co-dependent vibe that seems baked into those chord changes and epic lyrics, and it always freaked me out. I figured professional songwriters wrote those kinds of songs, and when I listened to them I imagined they were basically heartbroken old men – I didn’t think a woman who looked like a teenage sitcom goddess could have lived such heavy love stories. So for me, the weepy thing fit her like a bad suit. Those songs would be believable if Etta James sang them at age 60, but having a 20-year-old sing them felt to me like a bad game of dress-up. But a lot of people were feeling it, like that Salon writer, who fell in love with all the drama at age 12. 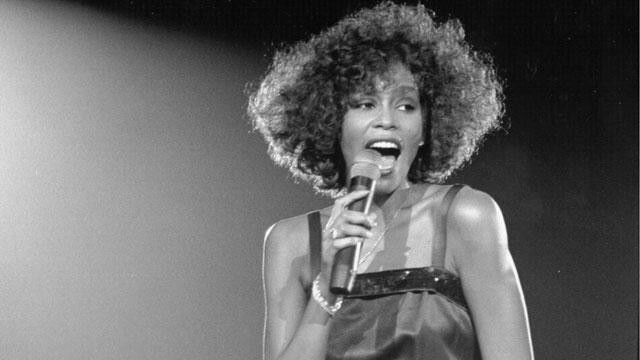 The point where her article bugged me out, though, was when she noticed that the whole arc of Whitney Houston’s life was pretty much summed up, ahead of time, in the lyrics of “Didn’t We Almost Have It All.” Even the way the melody peaks very early, and then “throws out its back” trying to recreate the magic of the first verse – it’s the same in a bunch of her huge hits, like “I Have Nothing” or “I Will Always Love You”. Her signature songs were always the “heroism” of a very wrong love scenario that she refuses to give up on. And I thought of how she had to sing those songs, over and over, for worshipful audiences from a very young age… and how she then met her husband. And lo and behold, within a few years she was, in fact, living one of those awful, fatalistic “love” arcs she had been singing about. It’s a weird side-effect of performing that seems to hit lots of actors and singers. It’s like they meditate on the scenario and then manifest it for themselves. So what I’m saying is: I kind of believe, in a way, that sappy songwriting killed Whitney Houston. It’s like a bunch of people outsourced their heartbreak to her as a teenager, and since she got a big thumbs-up from the world for her ability to dramatize, she took that as the script for her life. I just think, you know, maybe when somebody says a song is bad – and I can tell you that when I was 16 I thought those ballads were wrong, wrong, wrong on a ton of levels, starting with the keyboard sounds – sometimes they’re saying, that song would kill me. But Whitney could sure put them over. The songs still give me shivers, even the ones I can’t stand.